The trench deadlock was broken by occasional large offensives, and by constant shelling, sniping, and raids. These attacks across No Man’s Land and into enemy lines could be small efforts by a handful of soldiers to gather information or capture prisoners, or large, complicated affairs involving artillery, aircraft, engineers, and many hundreds of troops. 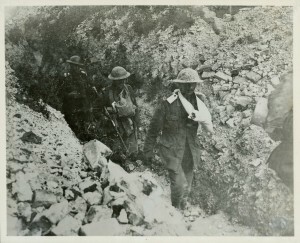 Night patrols into No Man’s Land offered relief from the boredom and grinding tension of trench life, but always in exchange for great physical effort and a high risk of injury, death, or capture. Desperate battles sometimes resulted when patrols ran into each other, while enemy sentries, if alerted to a patrol’s presence, could bring down flares to illuminate the scene, followed by small-arms, machine-gun, and artillery fire. Larger and more complicated raids were more like miniature set-piece battles than the night patrols that marked the first years of war. They required careful planning and preparation, and the coordination of the raiding party with machine-gunners and artillery. Not all raids were small. In November 1915, the Canadians launched a large, audacious raid that killed and captured many Germans at Petite Douve farm. 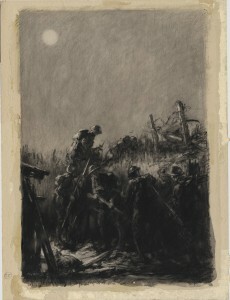 Through this and other efforts, the Canadians gained a reputation for fierceness in raids that nevertheless continued regularly to incur heavy losses. Trench raiding honed infantry tactics and, according to many officers, kept the troops alert, motivated, and aggressive. The rank and file often viewed the raids differently, as terrifying and pointless affairs that usually resulted in heavy casualties, often to the best soldiers in the unit. This photograph, probably taken at dawn, shows three Canadian soldiers with camouflaged faces coming out of the line following a night trench raid at Avion in July 1917. The soldiers have camouflaged their faces, most likely with pieces of burnt cork. From late 1915, Canadians participated in hit-and-run assaults on German trenches, known as trench raids, to gather intelligence, capture prisoners, and kill the enemy.